Sarah and I recently made our somewhat-annual hike up the Mist Trail in Yosemite, enjoying the heights and sounds of Vernal Falls and Nevada Falls, as well as the Panorama Trail. It was not a serious photography outing since I was huffin’ and puffin’ just keeping up with Sarah who is a serious hiker and in better condition than I. We did make a stop just below Vernal Falls where we made the photo below. This is a place at which I always stop for a photo, and often there is a rainbow in the composition (see bottom of this post). On this day, however, breaking out the camera was especially difficult because of the enormous amounts of spray produced by near-record flow in the Merced River. I had about a second to get the shot before the lens would fog over with spray. I tried a dozen times and then gave up not wanting to damage the camera. I got this one keeper frame out of the attempts. Vernal Falls and Merced River in spring, heavy flow due to snow melt in the high country above Yosemite Valley. While we were hiking, we discussed the potential pitfalls of the hike, the short sections of the steps leading up to Vernal Fall which are most dangerous, where a simple slip can lead to a deadly fall down the steep and slippery rock apron and into the raging Merced. We also discussed the danger around the top of Vernal and Nevada falls, each of which has seductive and exceeding risky brinks. She got the message and I didn’t browbeat her too much, but quietly kept her within arms reach during some of those more nervous sections of the hike. A few weeks later I had a somewhat unsettling experience. After enjoying a family reunion in Yellowstone during which I had the phone and email turned off for a week, I returned to my office to find that the most popular images on my website for the previous week were all images of Vernal Falls. Then, catching up on messages, I found two urgent calls from news organizations asking for images of the falls to run in breaking news stories. “Uh oh.” Indeed, with a quick search of recent headlines I learned that three young people had tragically died after slipping into the Merced above Vernal Falls and going over the edge. What a terrible event, for the three young hikers but also for all the others present on the brink of Vernal Falls at the time it happened. I felt sick in the gut, knowing Sarah and I had been there just a few days prior, walking those same steps and having one of the most enjoyable days together we have ever shared. With just a small misstep, the Mist Trail can turn deadly, and indeed it does almost every year. This year the Mist Trail has claimed at least four lives. Yet, it remains one of my favorite trails and I will continue to hike it with Tracy and the girls as long as they can tolerate my slowing pace and lame jokes. 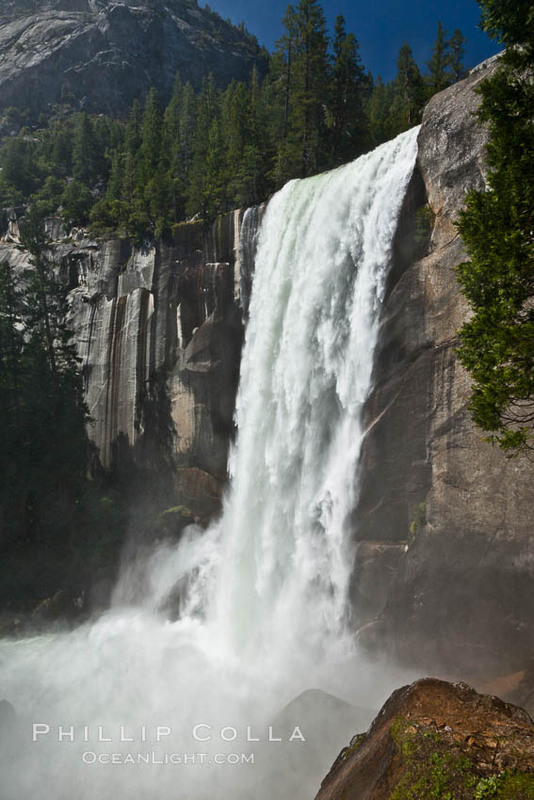 About the Hike: Spring is the time to visit Vernal Falls and the famous Mist Trail in Yosemite National Park. Vernal Falls is at peak flow in late May and June, the weather is usually pleasant and the dogwoods are in bloom on the valley floor. We try to make a springtime visit to Yosemite each year to hike the Mist Trail with our daughters. We get soaked by the falls on the way up, soak in the sun and dry off at the top, enjoy a lunch of trail mix and Clif bars alongside other hikers, and leisurely make our way back down the trail later in the afternoon. 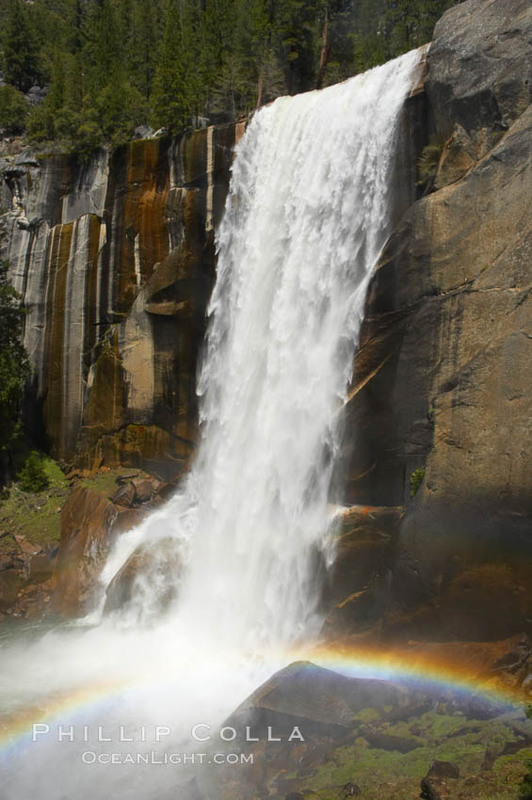 If one times his visit to Vernal Falls at midday, a rainbow is often visible in front of the falls when viewed from the trail just 100 yards away.